The Battle of Vimy Ridge captured the imagination of professional and amateur artists alike. Some of these artists served in uniform and participated in the battle. Other artists were not present, but painted the battlefields after the fact or from imagination. In a variety of styles and media, male and female artists, both Canadian- and British-born, responded to a number of aspects of the battle: the heroism of the soldiers, the massive number of casualties, the widespread destruction of buildings and the devastation of the natural landscape. 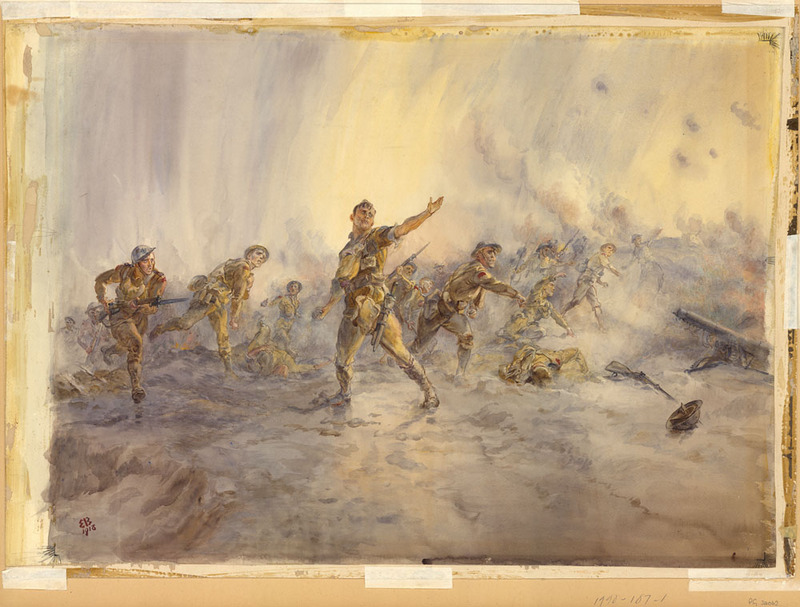 British-born Canadian soldier Frederick Thwaites Bush created some of the most evocative images of the battle. Trained as an architect before the war, Bush served as a lieutenant with the 29th Battalion and the Canadian Engineers. While in Belgium and France he sketched a number of sites, including Ypres, Passchendaele and Vimy Ridge. 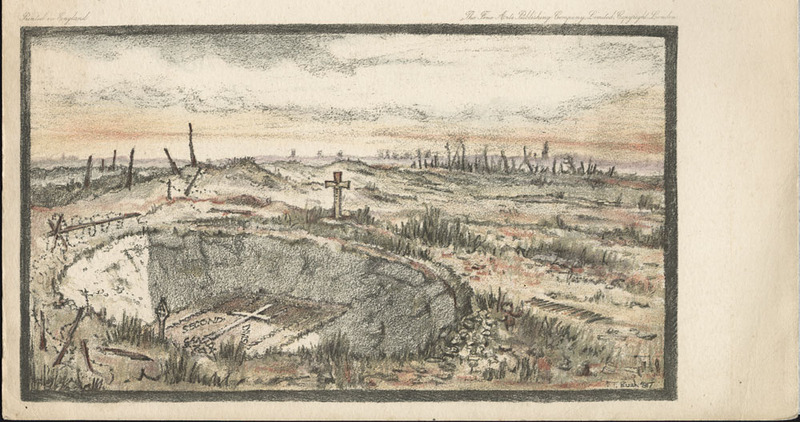 Based on a pencil sketch done on site, Bush’s colour lithograph of the mine crater and gravesite set within a degraded landscape captures the feeling of desolation and loss. Lieutenant Cyril Henry Barraud worked as an artist and commercial illustrator prior to the First World War. Born in England, Barraud emigrated to Canada in 1913, and when war broke out he attested in the Winnipeg Grenadiers. He was sent overseas in August 1915 with the 43rd Battalion, and in November 1917 was appointed an official war artist. During his time in France and Belgium, Barraud sketched along the front. Based on these sketches, he later created many etchings for the Canadian War Memorials Fund. 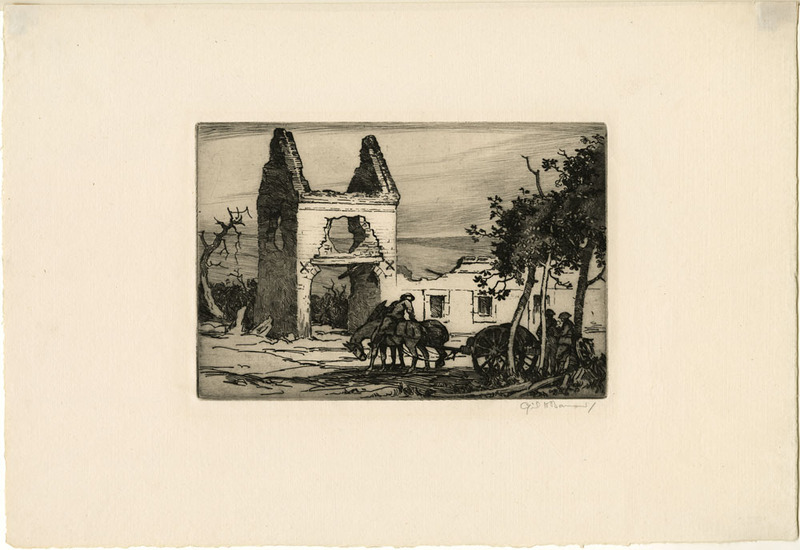 Images such as Berthonval Farm are typical of his carefully-composed style and combine war-damaged buildings with romanticized idyllic landscapes. This work was part of the Canadian War Memorials Exhibition held in London in 1919. Reuben Alvin Jukes (Jucksch) was born in Hanover, Ontario. Listing his occupation as an artist, he attested in the 20th Canadian Battalion in 1914 and was sent to train in England. Jukes was sent to the front in January 1916. Although he was not an official war artist, a lenient commanding officer allowed him time to paint scenes while at the front. Due to an episode of what was then called shell shock, he was not present at the Battle of Vimy Ridge; however, he returned to active service in May 1917. 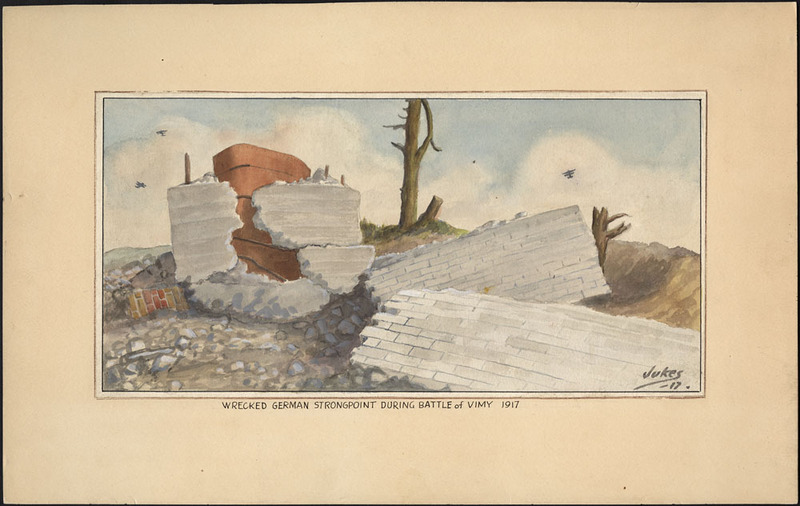 He subsequently painted a number of highly detailed, almost surreal watercolours, such as Wrecked German Strongpoint During Battle of Vimy, 1917, depicting the aftermath of the battle. 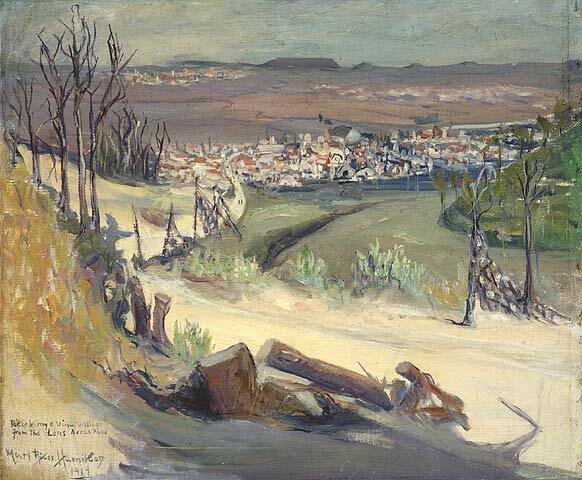 Some of the most expressive paintings of Vimy Ridge were produced by Canadian-born professional artist Mary Riter Hamilton. Although Hamilton was unsuccessful in her attempts to be appointed as an official war artist, she was commissioned by The War Amputations Club of British Columbia to provide images for The Gold Stripe, a veterans’ magazine. 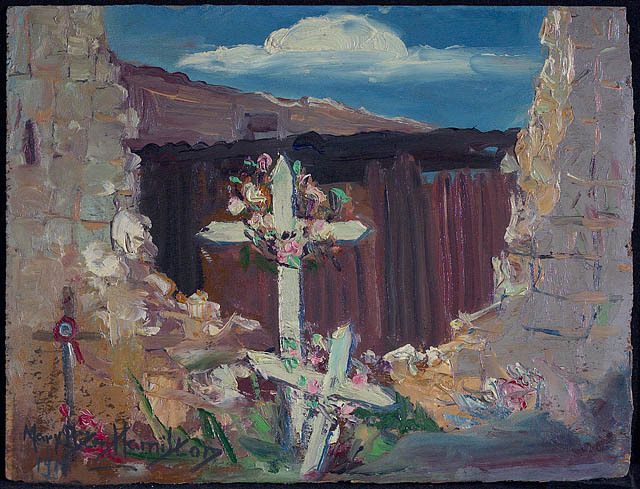 Hamilton was anxious to paint the sites where so many men died before any reconstructive efforts were undertaken, and left for Europe shortly after the war ended. She painted in Europe from 1919 until 1922 and produced over 300 works, including Gun Emplacements, Farbus Wood, Vimy Ridge and Petit Vimy and Vimy Village from the Lens – Arras Road. In both of these works, Hamilton’s spontaneous and loose handling of paint combined with a light palette demonstrate a sense of optimism despite the circumstances. Hamilton refused to sell her war paintings. Hoping that they would benefit the men who fought and their families, she exhibited them several times in fundraising exhibitions. In 1926 she donated 227 paintings, drawings and prints to the Public Archives of Canada (now Library and Archives Canada). The Battle of Vimy Ridge captured the imagination of another professional female artist—Lady Elizabeth Southerden Butler. Lady Butler (née Elizabeth Thompson) was an academically-trained English artist who specialized in realistically rendered paintings of battlefield warfare. In the late 19th century she gained popularity from her romanticized, heroic depictions of the Crimean and Napoleonic wars. Stylistically similar to her earlier works, Cede Nullis, the Bombers of the 8th Canadian Infantry on Vimy Ridge, 9th April 1917 depicts the 8th Canadian Infantry (part of the Canadian 3rd Division) on the day that the Canadians took the ridge. The watercolour was painted while she was living in Ireland, and was exhibited in May 1919 in London. The work was acquired at auction in 1989. The victory at the Battle of Vimy Ridge was one of the most important moments in Canadian history. Immortalized in art, the bravery of the soldiers and the sacrifices of the battle have become integral parts of our national mythology. Katie Cholette has a BA (Hons.) in Art History, an MA in Canadian Art History and a PhD in Canadian Studies. She has previously worked as the Curator of Acquisitions and Research at the Portrait Gallery of Canada, held two Research Fellowships in Canadian Art at the National Gallery of Canada, and taught courses in Art History, Canadian Studies and the Humanities for the past 14 years at Carleton University. She has also worked on a number of freelance curatorial and research projects and is on the editorial board of the Underhill Review. This blog was developed under a collaborative agreement between Library and Archives Canada and The National Archives. This entry was posted in Military Heritage and tagged First World War, Mary Riter Hamilton, The National Archives, TNA-LAC, Vimy Ridge, Vimy100 by Library and Archives Canada Blog. Bookmark the permalink.